Think people going bald here in the 21st century have it tough? Just imagine what the folks of 100 years ago went through. Balding men were apparently so desperate for hair that they'd let a doctor near them with this terrifying machine. I was flipping through my collection of 1920s magazines when I came across this absolutely horrifying image. 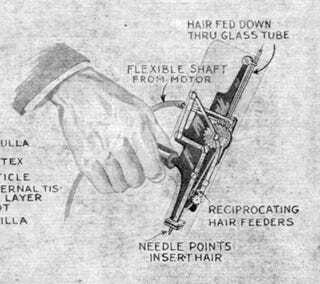 As best I can tell, it's one of the first (if not the first) machine invented for transplanting hair into a person's head. The images come from a 1921 issue of Science and Invention and included an article about the procedure. Apparently Dr. J. S. Parsegan of New York performed a number of these hair transplants for desperate men of the early 1920s. Above, Dr. Parsegan is seen using his machine at the annual banquet of the Baldhead Club of America in Connecticut. The doctor ingrafts upon the head of each of the subjects a half dozen of health hairs plucked from the heads of beautiful and healthy maidens and specially prepared for plantation, etiher blond or brunette as desired. After [massage] treatment, Dr. Parsegan inserts into a small machine a long female hair, not because the female hair grows better on a man's head, but it is rather difficult to find a man with hair 18 to 20 inches long. He then goes over the scalp with the aid of a magnifying glass and the instrument and presses a tiny button whereupon the following takes place: Two lances force their way into the scalp carrying between their jaws a section of the female hair. The method of operation is very similar to that employed by the mosquito when it inserts its spears (at least they feel that way) into the skin of the man. The jaws then spread slightly, leaving the hair within the tissue and a knife cuts the hair off short. He then proceeds to another location and if possible plants the hair into a follicle. Yikes. You'll notice there's no mention of an anesthetic. There is, however, mention of the belief that this procedure will "restimulate" the follicles, allowing the patient to regrow hair again naturally. Reportedly, the good doctor at least had the decency to try the machine on himself before subjecting patients to his treatments. Dr. Parsegan plugged over 50 pieces of hair into his tender head. Now that's what I'd call a hair-brained idea. I said, that's what I'd call a hair-brained idea. Hair-brained. Because it's hair.